Click through rate is not specifically an SEO concept – it really applies to any type of digital advertising – but we’re going to look at it through an SEO lens. Click through rate is the number of times that somebody clicked on something divided by the number of times that thing appeared. Most of time you’re going to look at those two numbers in terms of clicks and impressions with clicks being the number of times somebody clicked and impressions being the number of times it showed up. In the scheme of SEO, click through rate is going to be the number of times that someone clicked on your web page divided by the number of times that your web page appeared in search results. How do you get CTR numbers and how do you know what your click through rate is? The answer is Google Search Console. 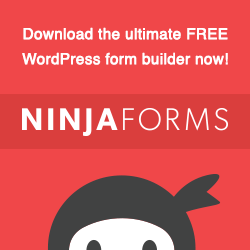 It provides all these numbers for you and it’s free to sign up which I’ll show you how to do in another video/post. 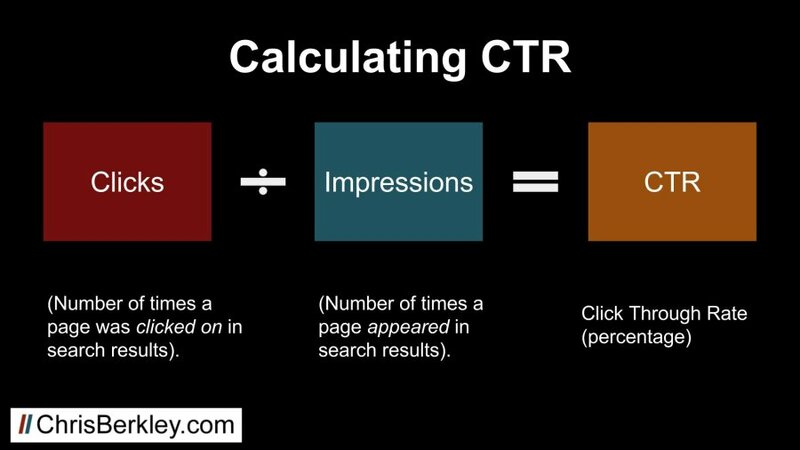 Let’s dig in a little bit and look at some of the ways that we can look at click through rate, clicks and impressions in Search Console. 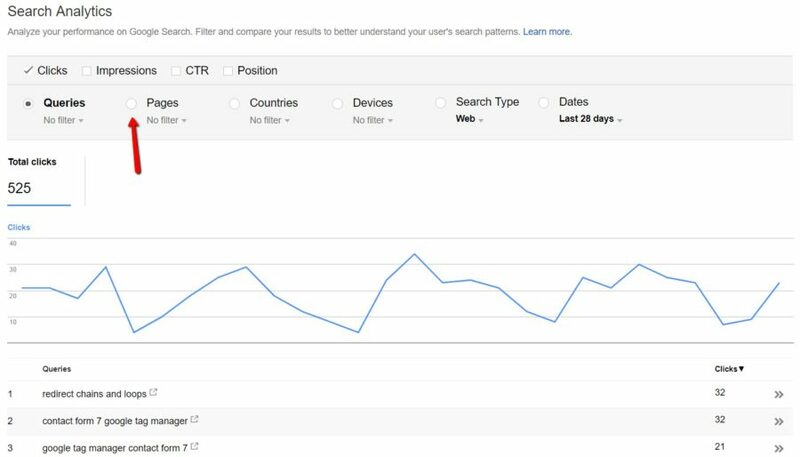 Once you’ve logged into Search Console, in order to get any type of click-through rate data, you have to go to Search Analytics and click on that. That will bring up the default set of data which is going to be focused on clicks and queries. Clicks will be the number of clicks to the site and it’s going to look at it on a per keyword basis. For the purpose of click-through rate this isn’t that beneficial because we know that the meta description is going to appear for most of the keywords that are driving clicks to the site and it’s not keyword specific so we’ll be better off to look at it at a page level. 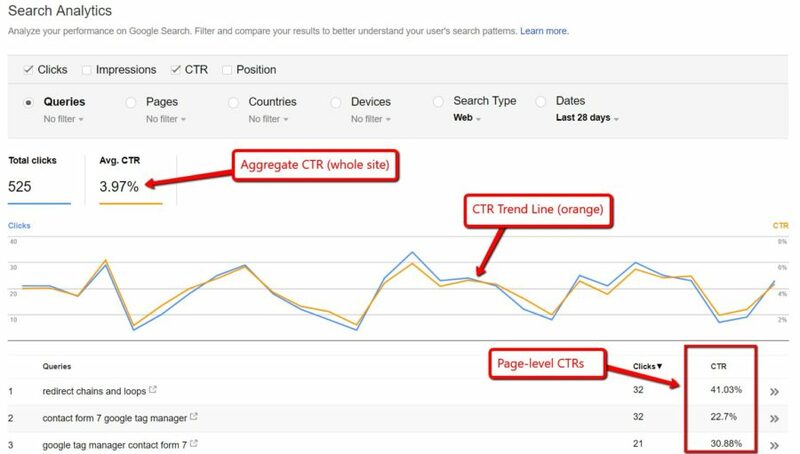 Clicking on the CTR box will show an aggregate CTR trend line and you can also look at the aggregate CTR value (for all the pages on the site). What’s more helpful is if you scroll down, scroll to the rightmost column and look at CTR data on a page by page basis. If you want to benchmark data, you can pick a particular date range – there are a couple presets – or you can do custom if you want to look at the click-through rate for a particular month, for example. There’s a couple other things in here you can do as well – you can add filters for country, filters by device – that may give you some insights into where you’re underperforming on a geographic or device basis and then that may inform the way that you run tests. Overall I think Google Search Console is a really underrated tool and this gives you some really crucial data that most people probably don’t look at as much as they should and may help you optimize your meta descriptions to get more traffic. Now that you know your click-through rates, or at least you know how to go get them and where to find them, the next question becomes: what to do with this information? Obviously a higher click-through rate is better because the higher the click-through rate the more traffic you’ll get but the question becomes how do you improve the click through rate? One very simple answer is being ranked better. Obviously higher ranked pages get a higher click-through rate than lower ranked pages because positions one, two and three are generally positions that receive more traffic. That’s very easy to say “well yeah just get your page ranked better” but not always as easy as it sounds because especially in competitive industries we know that can be very difficult. Another way that you can actually influence a click through rate without being ranked better at all is to tweak the title tag and the meta description. The meta description in particular because since it’s not a ranking factor, it’s not as risky to change what’s in it because it’s less likely to have a negative impact on rankings. Improving the meta description can improve the click-through rate without actually being ranked any better which is remarkable when you consider that new meta descriptions are really easy to implement. Meta description tests you may want to run might include different CTAs and different language that are more actionable. Benchmarking performance data will allow you to compare different optimizations over time and see which one had a higher click through rate. What Should The Click Through Rate Be? One question you might have is “what’s the right number, what should my click-through rate be?” and there’s not really a great answer to that. It really depends on your business and the industry, your site. I think that’s more productive – it’s easier to try to be better than you were than to try to aspire to a number that you may not know to be accurate. Also worth noting that click-through rate can be looked at in a lot of different ways depending on the type of keyword. For example we know that branded keywords are going to have a much higher click through rate. If someone is searching for a particular brand they’re more likely to click on that than they are a more generic keyword. Keywords in different parts of the funnel are also likely to have different CTR. Keywords that have words like ‘cost’ or ‘signup’ in them – these searchers have likely done their research and they’re ready to buy. Consequently, they’re probably more inclined to click on a search results because of that. If you have any questions feel free to leave a comment or tweet me @BerkleyBikes. Definitely subscribe to my YouTube channel if you want to see more videos/posts like this one.